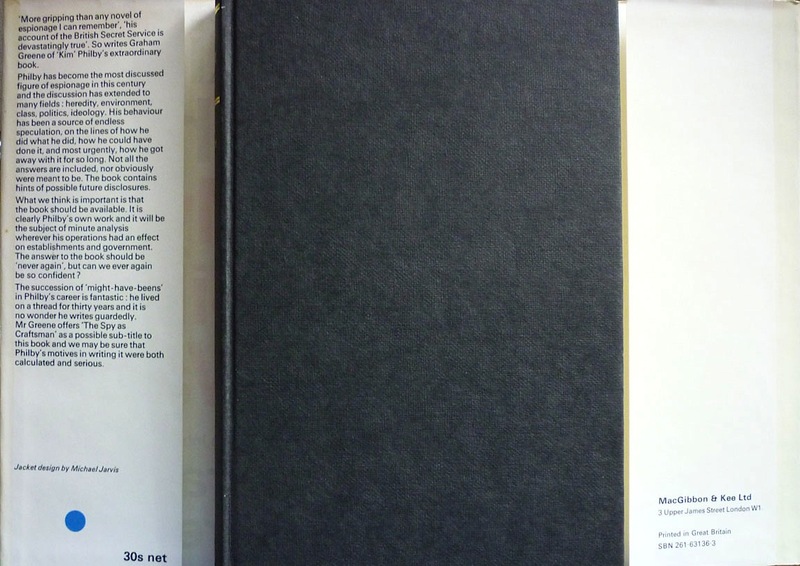 This is the British hardback first edition of My Silent War, Cambridge spy Harold Adrian Russell "Kim" Philby's autobiography, published by MacGibbon & Kee in 1968 under a dustjacket designed by Michael Jarvis. 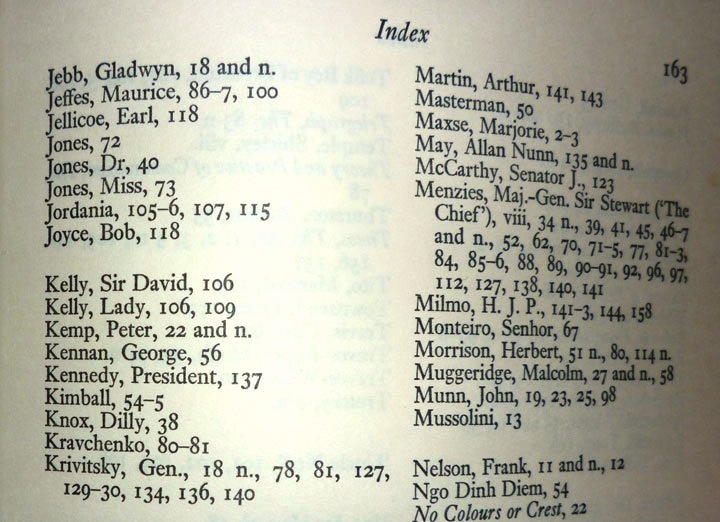 Crucially, however, it's also the first impression, which makes it really rather special: most of the copies listed for sale on AbeBooks are later impressions, in which two catty references to Lady Kelly, wife of Sir David Kelly, British Ambassador to Turkey and then the USSR, have been removed (the 1968 US Grove Press edition retains the references); among other disparaging remarks, Philby describes Lady Kelly as "an appalling female... distinguished by a mind both pretentious and pedestrian". 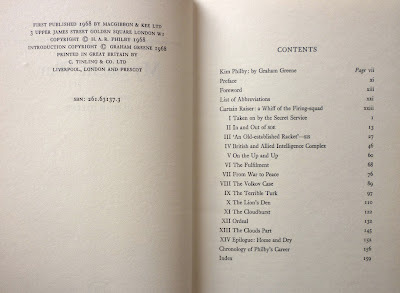 I've blogged about Kim Philby – probably the most famous of the five Cambridge spies – a fair few times before, most recently in this post on spy novelist Anthony Price (as was established last year, Price was one of the authors Philby read during his Russian exile), but also this post on Philby's wife, Eleanor's, autobiography (also published in 1968); this one on Patrick Seale and Maureen McConville's 1973 biography of Philby; this post about Graham Greene's The Human Factor (Greene, a firm friend of Philby's, provides an introduction to My Silent War – more on that anon); this one on Alan Williams's speculative novel about Philby; and of course this review of John le Carré's Tinker, Tailor, Solider, Spy, Philby's treachery having inspired le Carré's masterwork. 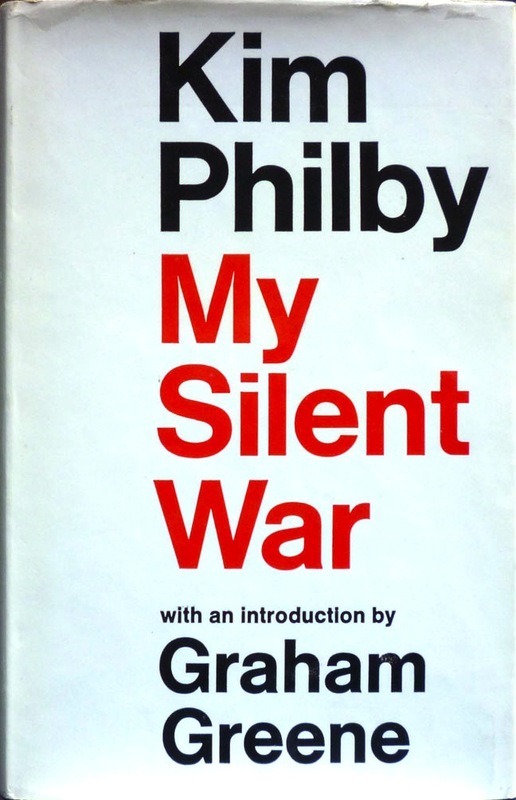 I suppose I keep returning to him because of my interest in spy fiction and espionage, but of all the Philby-related books that have been published over the years, My Silent War was the one I most wanted to read. The fact that I joined the British Secret Intelligence Service is neither here nor there; I regarded my SIS appointments purely in the light of cover-jobs, to be carried out sufficiently well to ensure my attaining positions in which my service to the Soviet Union would be most effective. My connection with SIS must be seen against my prior total commitment to the Soviet Union which I regarded then, as I do now, the inner fortress of the world movement. It's striking, then, that much of that "service to the Soviet Union" is dealt with in the book either by inference or obliquely. The first half of My Silent War details Philby's recruitment to SIS and the war effort, with attendant office politics, training, organisation, reorganisation and gossip, with nary a mention of Philby's "other" career. It's only once British attention turns away from Germany at the close of the war and instead towards Russia that Philby really mentions his "Soviet contact", but even with Philby's arrival at Section IX, which targeted the USSR, he seems more interested in departmental hierarchy than in his KGB spying duties – although since the configuration of Section IX directly impacted SIS actions against the Russians, that's perhaps a good example of Philby's oblique approach to his extracurricular activities. Indeed, the picture Philby paints of SIS isn't especially flattering – "shambolic" would be the best word to describe the service Philby depicts – something which has been identified by E. D. R. Harrison in his 1995 Intelligence and National Security article "More Thoughts on Kim Philby's My Silent War" as Philby's "vendetta against the West". The accusation is that Philby's memoir is KGB propaganda, pure and simple, and there may well be a large element of that in the book. But in his earlier Intelligence and National Security article "Some Reflections on Kim Philby's My Silent War as a Historical Source", Harrison betrays his own politics when he notes that Philby's "praise of the USSR at times verges on the ludicrous". 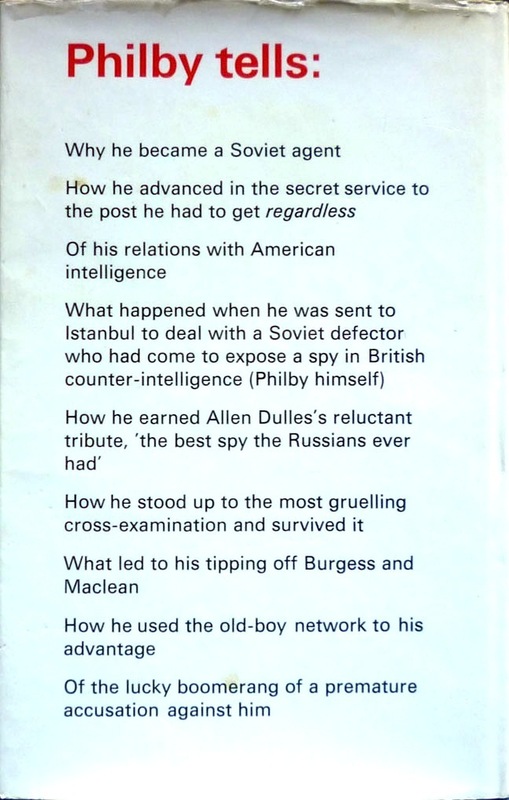 I'm sure it strikes Harrison as such, but since Philby himself states that he was "a straight penetration agent working in the Soviet interest", it's a little disingenuous to criticise the book in that light, however mistaken or misguided one might feel Philby was. Of course, the ideological clash between East and West was titanic, and arouses strong passions still. And given the scope of Philby's treachery, it's understandable that that, too, provokes profound distaste. But as the book enters its final phase, with the unmasking of Donald Maclean and Maclean and Guy Burgess's defection to Russia, and the subsequent interrogation of Philby by MI5, it's hard not to get swept up in the drama of it all. These were the highest stakes Philby, Burgess, Maclean et al were playing for, and though they were, in my opinion, wrongheaded, the manner and method by which Philby – and by extension his fellow Cambridge conspirators – maintained the deception over so many years is almost, dare I say it, admirable. As Philby puts it: "Thirty years in the underground is a long stretch, and I cannot pretend that they left no mark." 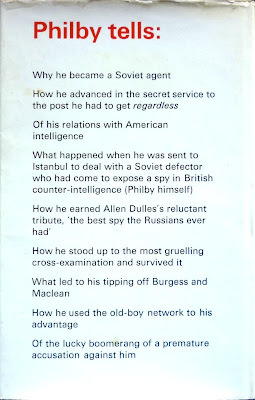 Philby himself defected in 1963; My Silent War was written during his Moscow exile, and was therefore almost certainly vetted by the KGB – hence Harrison (and others') accusations of propaganda – in which context the withholding by Philby of information about his handler(s) becomes more explicable. Philby is well aware of his omissions – of one appointment with his "Soviet friends" he notes wryly, "What passed there is no concern of the reader" – but here again, Philby has an answer for his critics, particularly concerning the seven years he spent in the Middle East prior to defecting, which he largely glosses over in the book: "If the British Government can use the fifty-year rule to suppress the publication of official documents, I can also claim the right to veil in decent discretion events that took place as little as ten or five years ago." Conversely, this explanation comes in the epilogue, which is actually more open about Philby's "career in Soviet service" than the preceding 150 pages. We were told to expect a lot of propaganda, but [the book] contains none, unless a dignified statement of his beliefs and motives can be called propaganda. The end, of course, in his eyes is held to justify the means, but this is a view taken, perhaps less openly, by most men involved in politics, if we are to judge them by their actions, whether the politician be a Disraeli or a Wilson. 'He betrayed his country'—yes, perhaps he did, but who among us has not committed treason to something or someone more important than a country? In Philby's own eyes he was working for a shape of things to come from which his country would benefit. 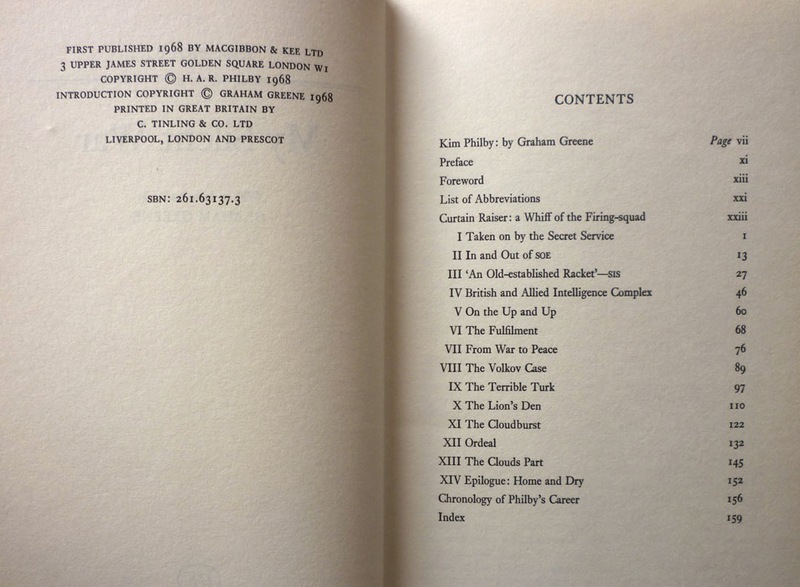 As for the denigration of SIS highlighted by E. D. R. Harrison, Greene, who had first hand experience of SIS, notes that Philby's "account of the British Secret Service is devastatingly true". Very nice post. I'd recommend you look for the memoirs of Yuri Modin, the KGB controller of the Cambridge Ring in London. That's an interesting read (with a knotty publication history that would be meat for a tasty EE post...) and confirms that KP wasn't recruited in Cambridge, but in Vienna after he graduated. A much more likely scenario in any case: Austrian politics were violently polarised, and there was ample opportunity for the young Philby to come into contact with all manner of communists without leaving any trace for later vettings to pick up. And for an account of Philby's none-too-challenging interrogations at the hands of M16, see Peter Wright's Spycatcher. Here's a name that you'll enjoy. Viktor Suvorov. 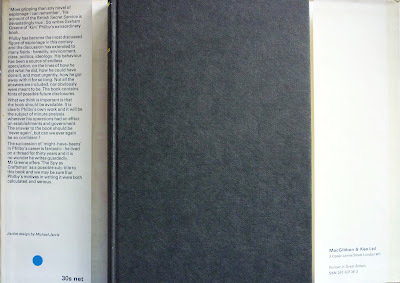 Check out "Aquarium"
"which made meat for that tasty EE post we all remember from May last year..."
Yuri Modim book gives a good overview, recommended. Thank you for the additional recommendation, Mathias!